Check out the Scottsboro Solid Waste holiday schedule to find out when we pick up on holidays. We care about our environment, did you know that enough plastic is thrown away each year to circle the earth FOUR times. 4.5 Million tons of office paper is thrown away each year in the US. Enough office paper is thrown away each year to build a 12 foot high wall of paper from Los Angeles to New York City. 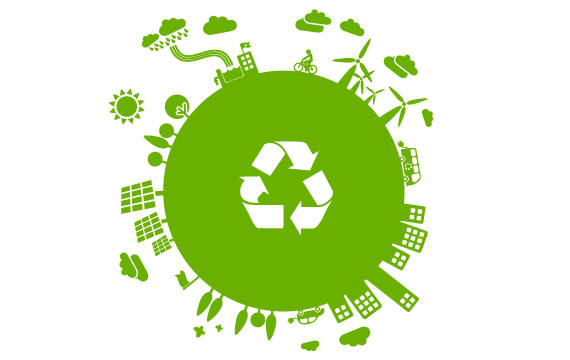 Recycling saves the environment, the earths resources, energy, reduces litter, saves landfill space, and takes very little time. Scottsboro Solid Waste offers it's recycling program to Residential Customers as well as Business Customers. Want to get involved? It's easy, all you have to do is stop by the Scottsboro Solid Waste office and pick up a recycling bin. If you're a business just call the Solid Waste office and we will get recycling cans out to your business. For more information on when recycling is picked up and what we accept in our recycling bins check out the links below or contact us. Interested in the Management plan for the Solid Waste Department? You can view that here. Listing of Landfill Tipping Fees and additional information. As the saying goes, “One man’s trash is another man’s treasure”. The Scottsboro Solid Waste Department and the City of Scottsboro reaps these benefits through a stimulus grant to convert Waste to Energy. In February 2010 the City of Scottsboro was awarded an Energy Efficiency Grant, part of the Green Energy Stimulus Package, to convert Waste to Energy. The methane gas captured at the Scottsboro landfill is being collected and sent to a 500 KW generator to produce electricity. The city of Scottsboro has partnered with TVA and North Alabama Electric Co-op to sell the electricity that is generated. A flare system has been installed to burn away any excess gas, preventing the greenhouse gas from being released into the atmosphere. The Alabama Department of Economic and Community Affairs (ADECA) administrated this grant with funds made available by the U.S. Department of Energy as part of the American Recovery and Reinvestment Act of 2009. This Green Energy Project is not only a valuable energy source for the City of Scottsboro but it is also good for our environment. This project can be seen at the Scottsboro Landfill. This depends on the location of your Residence or Business. Most residential routes are run once a week, and commercial pickup routes for business can be run up to 6 times a week depending on your needs. You can find more information on the Residential Collection Information and Commercial Pickup Information pages. You can view a listing of trash pickup times here. If you're still not sure what day your pickup is you can contact the Scottsboro Street Department at 256-574-3821 to find out. My garbage was missed today. Why? 1. Make sure your garbage was at the curb by 6:00 a.m. If not, the truck may have already run. 2. Don't assume that your garbage has been missed because it wasn't collected the same time of the day it is normally. Equipment breakdowns, substitute drivers, or other variables, could cause this time to change. 3. Make sure your cart is placed within two feet of the curb with the arrows pointed toward it and at least five feet form any obstruction such as a mailbox, fire hydrant or utility pole, Also, make sure a parked car is not preventing access to the cart or items piled on top of container or around it. If your garbage has not been collected by 1:30 p.m. call the Solid Waste Office at 259-5548 and report it. My container is damaged. What do I do? Damage due to negligence of the user (such as dumping hot ashes into it, or running over it) will be charged to the user. Damage incurred by normal use will be repaired or replaced by the Solid Waste Department, call 259-5548. My container smells. Will you replace it? Container cleanliness is the responsibility of the user, discarding garbage into the container in plastic bags and occasional rinsing will help this problem. The Scottsboro Landfill is located at 650 County Rd. 412, Hollywood AL. County Rd 412 is off Hwy 72 around the Mud Creek area. Call (256-574-2714) for further directions or (256-259-5548). For garbage, use the 95-gallon automated container provide by the city. Garbage will not be collected from any other type of container(s). How do I sign up for garbage collection in the county? The Scottsboro Solid Waste Department only picks up waste in the city limits, Jackson County has its own collection call 256-259-2820 for County Collection. Garbage is waste that comes out of your kitchen or bathroom; essentially, food waste or paper products. Trash is anything other than garbage such as grass clippings, twigs, hedge clippings, junk, rubbish, cardboard boxes, etc.